Yes. This means that Home Architects has the capability to create photo-realistic “renderings” of the designs they create for you. Not only that, but three-dimensional, photo-realistic MOVIES as well, flying around the outside of their designs, and even Through the inside of them as well. 1. IT IS WAY COOL. It is said that a “picture is worth a thousand words.” And a movie is worth a thousand still pictures, to help you and your architect understand what your design looks like, way before it is built. This is a thrilling experience. It is fun! The 3D perspectives and photo-realistic movies of your design help you, your architect and very importantly, your builder understand what your project looks like and how it goes together. This will help your project get built faster and with less problems, because everyone can see how things fit together. You may decide to have several iterations of the 3D renderings and movies, during the course of the architect’s design work, to help you understand what the design looks like. 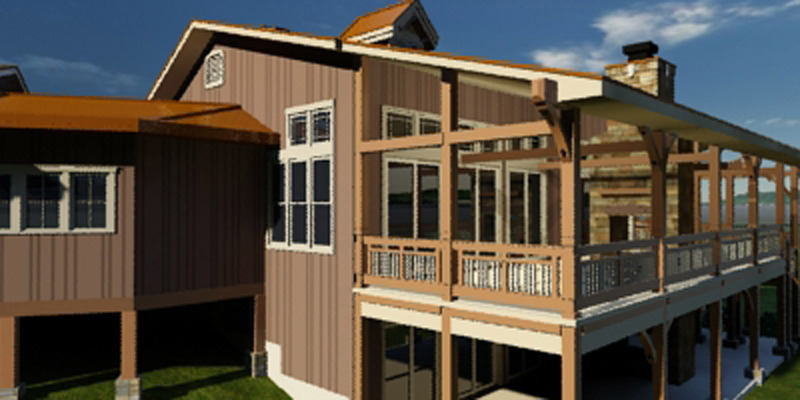 Many people have difficulty in visualizing floor plans, elevations and building sections. Having an actual movie of the developing design helps you accomplish this. Or, you may wish to wait until the design is done and the Construction Documents completed. It is up to you. Another view of one of the Home Architects projects. (C) Copyright 2011 Home Architect, PLLC, All Rights Reserved Worldwide. Views like this can be animated as well. This architectural firm’s team are world-class, highly experienced 3D digital imagery professionals. This is what they do for a living. This means they can do this complex & cutting-edge work faster and more effectively, with fewer technical and software questions than someone who does something else as their main job. The architect and other professionals coordinate with the 3D pros, providing them with the digital construction documents, allowing the 3D image people to “build” the 3D renderings and 3D movies from the project documents. The architectural company now offers this service at an economical price to their clients. Outdoor Living Room is what the Architect calls this portion of many of their projects, complete with outdoor fireplace (on both levels) and a patio serving the Family Room below. Note the 11′ tall glass composed of 8′ tall rear patio doors + transom lites above for a Huge view of your special land. (C) Copyright 2011 Home Architect, PLLC, All Rights Reserved Worldwide. Designed by Home Architects. “flying around” and “walking through” your virtual design, you can feel what your design will be like before it is built! What a wonderful option to have! Seeing the final design before it is actually built gives you a feeling of confidence, that things are resolved to your satisfaction, so you are not surprised during construction. 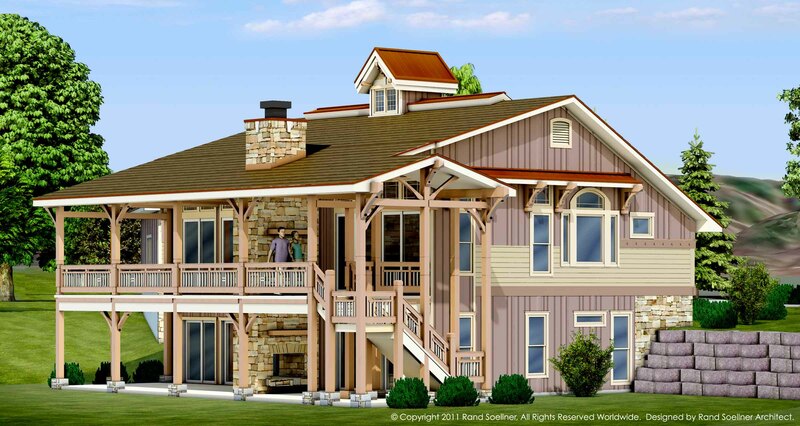 Building a home is a very complex procedure, and visualizing the design can be difficult without 3D tools like this. 5. LIGHTING CONDITIONS OPTIONS. if you wish, you can select an additional option to allow you to see your photo-realistic virtual reality design under varied lighting conditions, such as at 10 AM, 12 Noon, 2 PM, 4 PM, dusk, night time (with lights on in various places), giving you an understanding of what your project will feel like under various illuminations. 6. COLOR OPTIONS. if you want, you can select and pay for an optional additional virtual reality study to try out different color combinations for various materials, like roofing, wall siding, stone and the like. 7. SEE YOUR PROJECT FROM ALL ANGLES. Instead of trying to understand what your project will look like from only flat elevation drawings, you now have the optional ability to see a movie of your project, just like you were there, walking around it and through it, if you wish. 8. MARKETING. If you ever wish to sell this house, you can use the 3D files to communicate clearly what features it has. 9. ENHANCED COMMUNICATION. It is estimated that about half of a human’s brain is dedicated to analyzing visual information. Rendering that information into a photo-realistic 3D image, and an actual movie, communicate much more easily, effectively, quickly and completely that only two-dimensional graphics. tags: 3-D architectural visualizations and digital movies, cashiers, Roanoke, Virginia, Sevierville, Atlanta, Hendersonville, Highlands, Glenville, Lake Toxaway, custom.